We provides best IT solutions rapidly against customer’s problems and issues in various business process. We contribute customer’s business Improvement and solving problem by Website application development or software package. 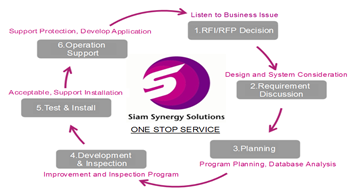 We provide one-stop solutions from finding current concerns & requirement, system design, development and after support. We have various Software packages for each business field. We will select best packages that match to your requirements. After that, we will discuss with customer to expand gradually by high priority functions. We develop Website application for respond specific business and customer need. 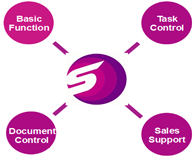 Because we develop by our framework then we can provide high quality applications quickly. Our system development focuses on "small start" and "flexible system expansion"
We start from install only necessary function. After that we will modify for according condition and expand function. We start from small point for reduce a cost.